Butch Harmon Right Grip Golf Gloves ~ RIGHT Handed - XL Extra Large! 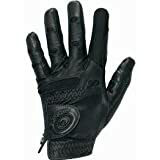 Butch Harmon - Right Grip Golf Training Gloves Unisex Size Medium for Right Handed Players One Pair Green, Yellow and Black Leather and Nylon Construction Retail between $39.99 - $79.99 each Pair -Soft Bar Technology provides proper grip pressure -Aligns Golf club in proper hand position -Develops muscle memory of grip and swing -Compatible with any golf club -Immediately hit longer, straighter and more consistent golf shots. The classic Bionic Golf Gloves allow you to maximize your game by giving your hands top of the line comfort and increasing club control. Daily use conditions and rehabs the hands, wrists and forearms by flexing and toning the muscles, ligaments and tendons. Use each button independently to exercise fingers or compress the entire unit for complete hand and forearm strengthening. The larger, flexible (latex-free) ergonomic base conforms to the users palm, cushions impact and significantly increases attainable range of motion. Progressive color-coded resistance gives users positive feedback. Comes with exercise program developed by a licensed hand therapist. 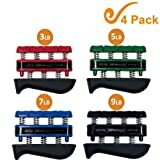 Grip Solid Golf Grip Training Aid The Grip Solid golf training aid is a thin rubber strap, which uses innovative 3D FLEX?BAR technology to solve grip pressure and position problems. Raised soft ergonomic FLEX?BAR fins on palm side contour against your club grip, working intuitively to eliminate "death grips" and help you achieve greater distance and accuracy each time you swing. FLEX?BAR fins promote accurate PRESSURE: * Press against your palm to instantly let you know if you're gripping too tight at all critical points of your swing * Encourages tactile recognition and develops muscle memory FLEX?BAR fins guarantee consistent POSITION: * Creates flexible barrier to keep club down in the fingers through your entire swing * Prevents club from slipping up in palm and re-gripping * Alignment Indicators ensure correct placement on hand Grip Solid PERFORMANCE * Solves hooks & slices * Improves distance & control * Develops accuracy & consistency * Works with any club - ready in seconds * Comfortable & lightweight - weighs less than 1 ounce * Easily fits in your pocket Grip Solid is the only golf training device that instantly lets you know when you're gripping too tight! Order your Grip Solid now and start playing better golf immediately. Have Fun Strengthen Hands, Wrists and Forearms in a Minute a Day With the NSD Power Gyroscopic AutoStart Spinner, you can get the same results in just a few minutes a day as you would if you spent hours per week in the gym. 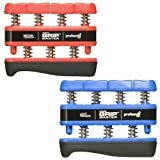 This compact hand, wrist and forearm exerciser features a gyroscopic core that spins at over 15,000 RPM and provides up to 24.9 pound-inch of torque to give your body the resistance required for fast, measurable results. 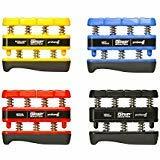 It¡¦s perfect for athletes looking to zero-in on hand strength, and it may even prevent and relieve repetitive stress-induced injuries, such as carpal tunnel and tendonitis. 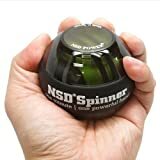 A Full-Featured Hand-Held Exerciser for Rugged, Long-Lasting Use This high-tech NSD Power Spinner is equipped with all the bells and whistles for simple yet intense hand, wrist and forearm training. It has an internal pre-tensioner that triggers AutoStart plus a built-in LCD display that allows you to keep track of your most important workout stats, including your historical top speed (*LCD display features on the model PB-688AC Black ONLY; It is a self-powered digital counter being functional when you reach 3,000 RPM). Plus, like all of our hand-held exercisers, this model is made from the most rugged materials ¡X including a military-grade plastic shell and reversible inner tracks ¡X to keep it in its best shape even if dropped.